Here is PRO-CAST®’s master control center where tape casting production variables such as casting rate, carrier speed, temperature profile, solvent gradient and atmosphere flow can be adjusted and controlled precisely. And this gets even better, with our human machine interface system you get a simplified operator interface and graphic displays that provide essential information and ease of control leaving almost nothing to chance which minimizes the need for operator intervention. In this short amount of time, we can only touch on the hmi system to give you a glimpse of its versatility. The Drive screen displays the conveyor and tape carrier speed. Adjustments made on this screen are controlled by a closed loop system connected to a digital tachometer and product thickness monitor. 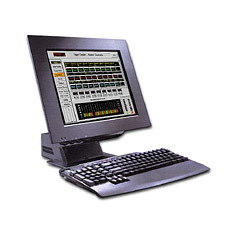 The Fans screen displays fan speed which defines the atmosphere flow and exhaust rate. These can be adjusted manually or set to automatic control via Pro-Cast’s “LEL” solvent vapor detection system to establish a precise solvent gradient across the oven. The Slurry screen displays the level of casting slurry or fluid in the reservoir. The level selected on this screen is maintained by an automatic casting fluid delivery system. And then there’s more. Pro-Cast’s powerful Real Time and Historical Trending capabilities make it possible to manage your production and stay way ahead of the competition. In fact, this hmi system is completely scalable and can be used throughout your factory to provide solutions from the production line to the back office. Its quite possibly the most versatile human machine interface on the planet. There is nothing else on the market like this new Pro-Cast tape casting machine. Just imagine what it can do for you.